Starting a new map? Here’s a small list of things to consider! I was asked by a couple of people over the last week asking how I go about starting a new map, and what I’m thinking about while making the maps I make – below is a small ‘guide’ based on the way I approach mapping. It may help you, it may not, but hopefully this at least gives you an insight into how I craft my worlds! It is in my opinion that the main component that drives a map’s creation is it’s theme. As such, you need to consider your theme before you can really make a start mapping. Ask yourself questions about what you’re about to create. “Where is this level going to be located”, “What textures compliment each other and ‘belong’ in this theme?” “What environmental assets belong in this theme that could affect the gameplay?”. Once you’ve come up with an idea you can start to make plans around it. For this page, we’re going to use the idea of an Aztec theme as the example – An aztec level might feature lots of natural and organic elements such as vines, caverns, plants and trees, all coupled with ancient architecture such as tombs and pyramids. In terms of gameplay, this theme lends itself to booby traps, crumbling architecture blocking off paths, rickety bridges, secrets hidden in plain sight, other ‘man made’ traps, for example, crushers. As you can see, once you establish a theme and the tropes of the theme, you have plenty to work with. 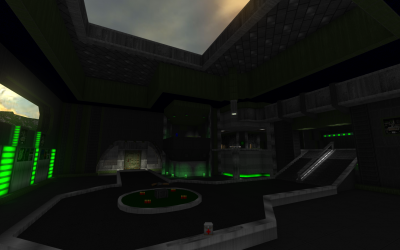 Now that you have a rough idea of what your level might look like, it’s time to work out what the goal of this map is. To help us, the mapper, make a level which both looks good and plays good, we need to ask ourselves more questions. “Why is the player here?”, “what is their ‘mission’?” and “how does the player win”? The mission could be as simple as get to the exit – a simple, linear, A to B type progression. But if you want to make it more interesting, perhaps it could be a key hunt with multiple paths to take from the start? Upon collecting the key, the whole segment of the level which the player just beat lowers into the floor, guiding the player back to the start. Once all keys have been collected, the full level will have been lowered to form a large arena. After the final battle, the player can then exit. This is just one example of a map’s progression; but the point here is that you need to work out what experience you’re going to give your players. Note how the objectives example above made a mention of guiding the player back to the start? This is often worded as ‘flow’ and is an integral part of building a good layout. When you make your map, constantly ask yourself “How well does the map convey the direction the player needs to go?”. A player who is truly lost is a player (probably) not having fun. 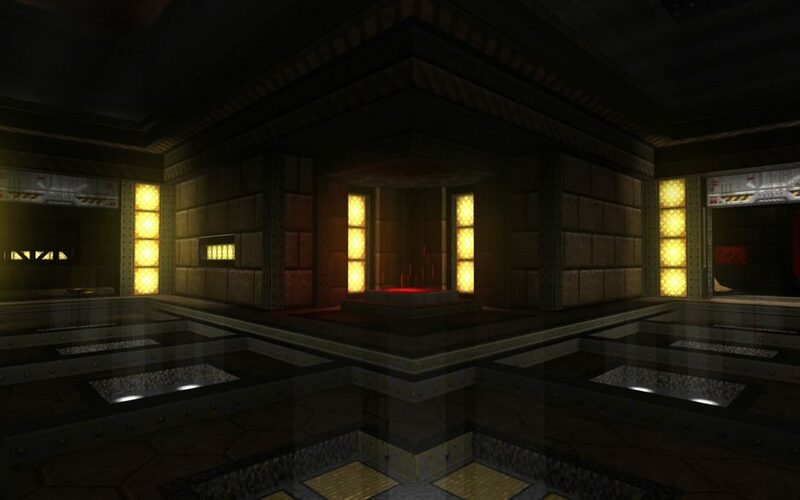 Some levels are intentionally built to be cryptic and hard to solve; these are usually exclusively puzzle maps however. In the context of a ‘standard’ level’s sense, you want to subtly hand-hold the player into going the right way, regardless of where they go to begin with. A simple example: Early in your level, you pass a yellow key door. After traversing much of the level, you end up in a room with the yellow key. 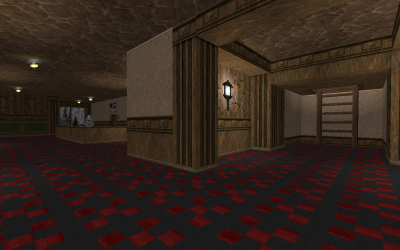 After collecting the key, the wall lowers to reveal the yellow key door seen earlier, right in front of you – this type of connectivity and guidance is helping the map “flow” comfortably, as it saves on excessive backtracking and other unpleasantries for the player. As an added bonus, this kind of connectivity in your map can lead the player to believe the mapper is very “smart” and planned their map’s layout carefully! You can see examples of this in pretty much any decent megawad. Likewise, you can use monster placement to repel a player from certain locations which you’d rather the player went to later on when they’re better equipped. 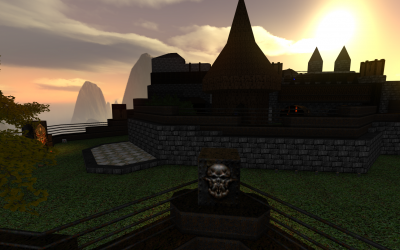 Use monsters or bright map geometry to help advise the player where to go next – if the area is mostly ‘dead’ or monsterless, but when they hit a switch a distant door opens letting out a few enemies, the player will naturally gravitate towards these newly-populated areas to see why they’re populated, and in the process see the now-open door. Gameplay is a topic of it’s own for another day, but in a nutshell, you need your map to be fun to make people want to play it. I always say that I map for myself, but seeing other people enjoying my works adds to my own enjoyment, so I do map for my players just as much as I map for myself. Now, it doesn’t matter if you have the most technically advanced, beautiful looking map in the world! If it plays like dirt, there’s little point in playing at all. What I advise is when you are building your maps, try to have a “gameplay-first” approach. Something that helps me a lot is building bits of the map at a time, ensuring it’s complete with gameplay, then testing it. I do this instead of making a full level and then populating it later on, as I feel it produces much more enjoyable end results. Stair sets with low ceilings which cause you to bump your head and lose momentum when descending them. Some simple things can be done to silently make the gameplay feel more intuitive for a player. For example, if an encounter is best handled with a rocket launcher, consider placing a rocket launcher just before the start of the fight – even if the player already has the weapon! It serves as a signpost which reads “I, the mapper, recommend this gun” without ever actually speaking to the player. To summarise, make your map based on a theme, employ the traits of the theme in ways that can affect the gameplay, build your map with gameplay in mind at all times, this ensures a more fun end result, and try to make your layout have a nice ‘flow’, without being too overbearing or confusing for the player.